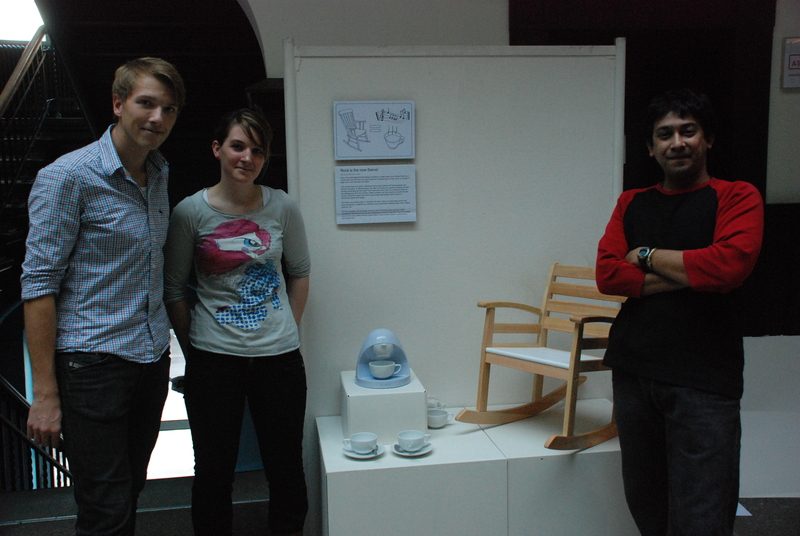 Eventually I have finished my final project report for my solo project at CIID. It contains most of my process and explorations! Updated process document of my final project…overview of what i’ve done!! 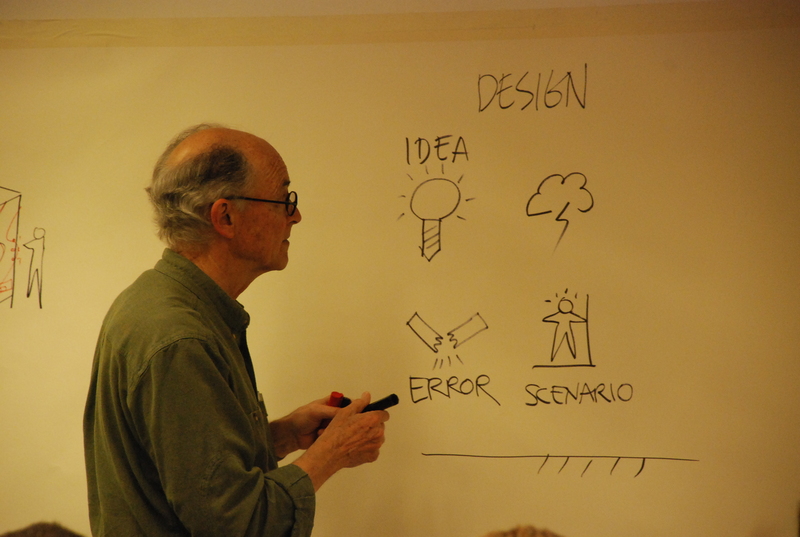 For the past few days we have been very lucky to have Bill Verplank teaching us. 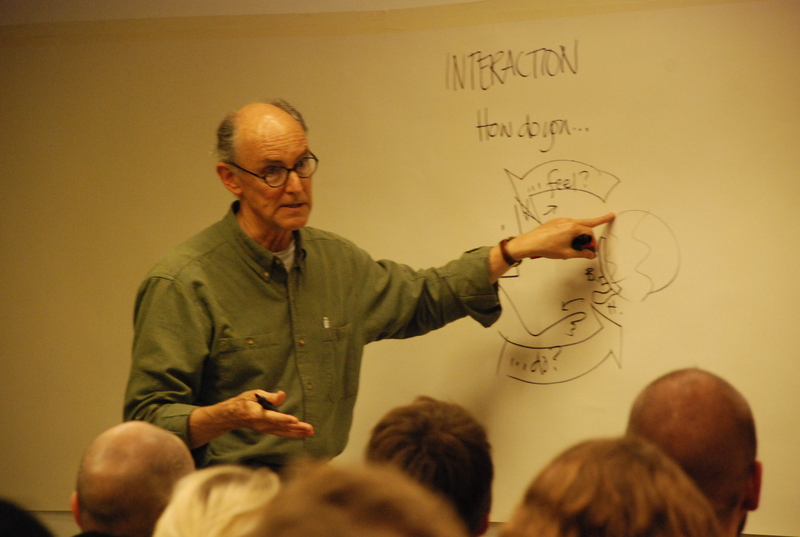 Bill is hugely experienced and has had a profound influence in the pioneering and emergence of Interaction Design as we know it……. 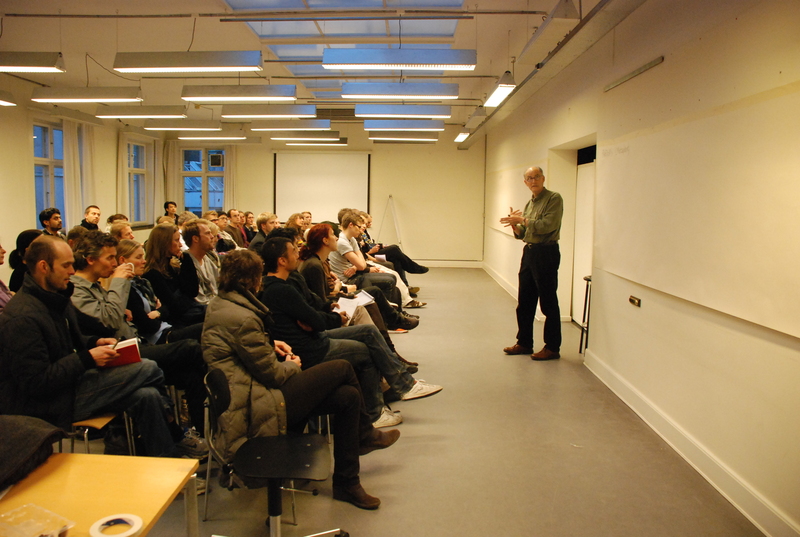 On Wednesday Bill ran an open lecture explaining the context of the history and future of interaction design and the way people think about the subject. 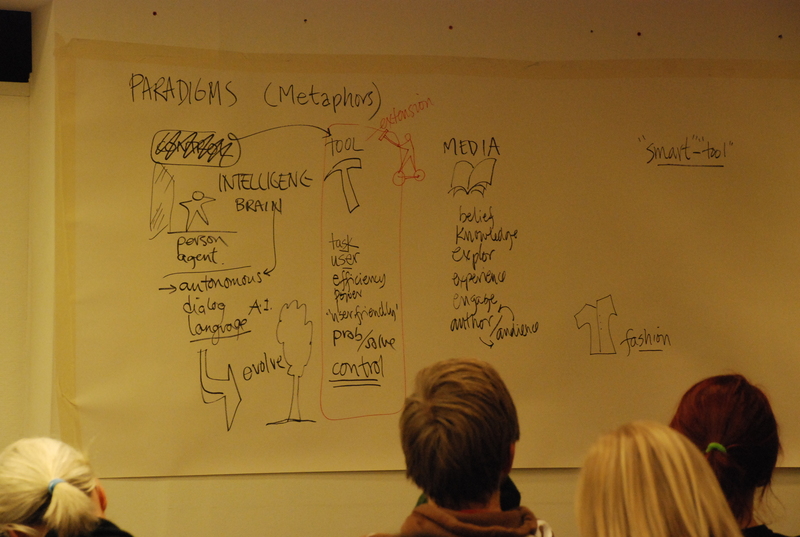 He described the process of designing interactions with beautifully concise diagrams. He’s ability to draw and write at the same time it amazing! Here are some photographs from the talk. To keep track of my work process as well as the project outcomes i will use my blog to take notes on processes, challenges, likes/dislikes etc. It is mainly for my own personal record but please feel free to comment! 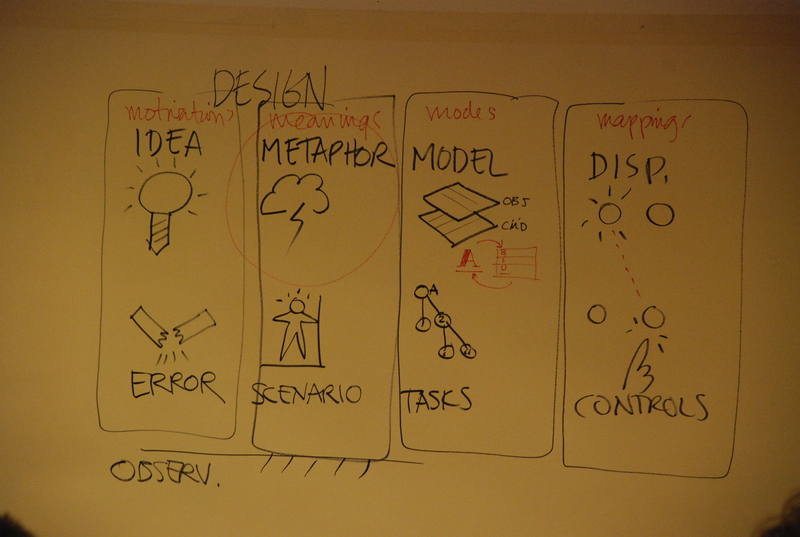 3.When we reached a point where we were excited about the idea and thought it fitted the brief we started to think about the technicalities of it….How would it work?What technology would we use?would it be engaging for the user? What existing physical products would be need? -Work out timings for turning system on/off, turning music on/off etc. -Chill out and present out idea! finding an idea that we were equally excited about,was do-able yet challenging enough and fitted the brief in a limited time frame. Creating a system that would work even if people interacted with it differently. Even though we only had 3 main variables within the system, numerous complexities on how someone would interact with it emerged. When our necessary parts we needed to progress didn’t arrive it became frustrating as we felt very unproductive. The ‘rocking chair’ gesture was very intuitive so the user would very easily know or learn what do as soon as they sat on the rocking chair and the experience began. The simplicity of the overall concept allowed us to created a well round experience that worked well and looked good. I think the concept of ‘Less is more’ applied to this concept and execution. The addition or music being played through the chair enhanced the user experience. The rocking chair and coffee maker looked completely un-hacked, they appeared as 2 stand alone artifacts. Only when the user interacted with them you realized that they were connected and could communicate together. They used the technology to create a little magic! Overall i loved the whole project, my favourite part was probally seeing everything come together at the end to create not only two products that worked together but also created a whole experience for the user.